As Black Friday madness recedes into memory, Sony Pictures Home Entertainment is offering families an unofficial alternative on December 2nd -- Blue Friday -- with 'The Smurfs' launching on Blu-ray and other digital rental / purchase platforms. Christmas may be my favorite holiday. My wife and I often decorate before Thanksgiving, I usually leave a string or two of lights up in my living room as cheap "cinema lighting", and one time I purposefully left up the office Christmas Tree until March to see just how long it would take my passive aggressive supervisor to directly request its removal (a hilarious and cheerful three months, it was!). So while the growing multitude of Dickens adaptations may be boring to some, I'm always up for a new twist on the classic tale. 'The Smurfs: A Christmas Carol' doesn't disappoint. This heartwarming, visually striking short utilizes both modern CGI animation as well as 2D cell animation reminiscent of the old TV show. The only catch, my HD-loving friends, is that it's exclusively available on DVD as part of the 3 Disc Holiday Gift Set (see below). A shame, because yesterday we were able to see an HDCAM copy of the short, which is richly detailed, colorful, and would have popped on ye olde HDTVe. However, after a bit of technical difficulty, we watched the most of the short projected from the DVD, and it admittedly looks pretty good in SD too. 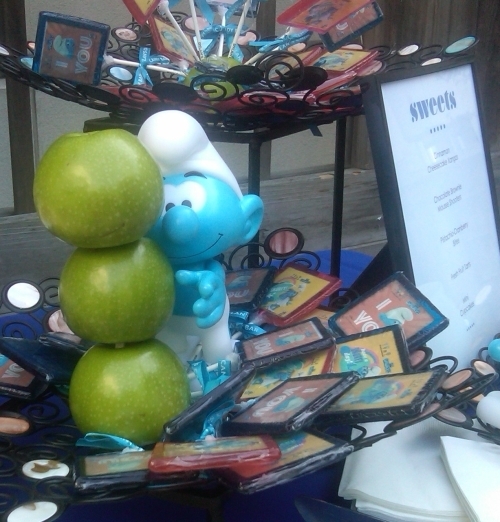 Next on our tour was a look at Smurf-O-Vision, also available exclusively on the 3-Disc Holiday Gift Set. While most Second Screen applications act like behind the scene featurettes, allowing users to dive into production designs and concept art, Sony did something quite different and really fun with 'The Smurfs'. Smurf-O-Vision is a free app that allows kids to play along with the movie in 15 unique activities. For example, if a character on screen is blowing bubbles, bubbles appear on your iPad and you pop them. There's also Smurfberries to poke, popcorn to pop, and flies to squash among other things. Sony was smart to make the Smurf-O-Vision application easy to use in a variety of scenarios. Users can sync the app to the film using a manual setting or WiFi (if your Blu-ray player is connected to your home network). And let's say your adorable little ones want to play Smurf-O-Vision, but you don't want to watch the film for the three trillionth time, or you're on the road with no Blu-ray available, the app still works as a standalone. The kiddies can play any of the 15 activities in any order they wish. Cleverly designed, oddly addictive, and technically you don't even need to buy the Blu-ray to ever use it. In fact, over 35 thousand people are already enjoying it. The Smurfs Village Game (available for Apple iOS or Android) has been around for a while, but it has a new Holiday Quest update featuring all new holiday-themed quests inspired by 'The Smurfs: A Christmas Carol', such as growing blackberries for holiday Smurfberry Nog, or helping the holiday-decorated mushroom village build a SnowSmurf. Another fun and free (my favorite price) app is GoldRun, which allows you to take family pictures with one of six Smurf characters. Simply adjust the characters' size and screen position to make it appear as if the Smurf was really standing next to you or the group. Then upload to your favorite photo-sharing or social networking site. How Many Different Ways Can I Buy the Smurfs? 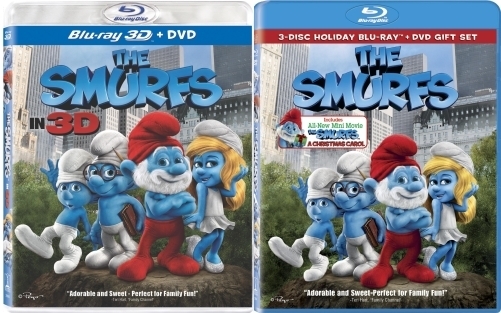 First, there's the 3D Blu-ray + DVD edition, which includes one Blu-ray with both 3D and 2D versions of the film along with The Smurfs Fantastic Adventure Game, and one DVD, which includes a Find The Smurfs Game. Both discs also host a number of behind the scenes featurettes and audio commentaries. Next, there is a 3-Disc Holiday Gift Set (which we just reviewed). This package features one 2D Blu-ray along with the Smurf-O-Vision: Second Screen Experience, a DVD of the movie, and a DVD of an all new animated short, 'The Smurfs: A Christmas Carol'. As part of a Walmart exclusive, the 3-Disc Holiday Gift Set includes a plush Smurf toy and a $5 credit for Walmart's Vudu streaming service. All retail editions of 'The Smurfs', including the DVD-only edition, include an UltraViolet digital redemption code for streaming and/or download from your Digital Locker in the Cloud. Why in the Smurf Would I Buy It? Look for our full review coming soon, but after finally getting a chance to see the film last night, I was really surprised. 'The Smurfs' is a fun family film sure to delight the kiddies, not bore the adults, and it looks and sounds pretty darn spiffy on Blu-ray (though the rear channels in the otherwise delightful 5.1 DTS-HD MA surround track seem to be mixed a little hot at times). 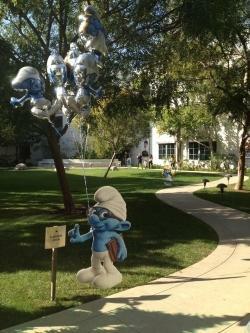 Pick up 'The Smurfs' on Blu-ray Friday, December 2nd! In addition to the physical copy editions mentioned above, the film will also be available day and date on various OnDemand, streaming, and digital download services such as Vudu and iTunes. Thanks again to Sony Imageworks and Sony Pictures Home Entertainment for a fun afternoon.